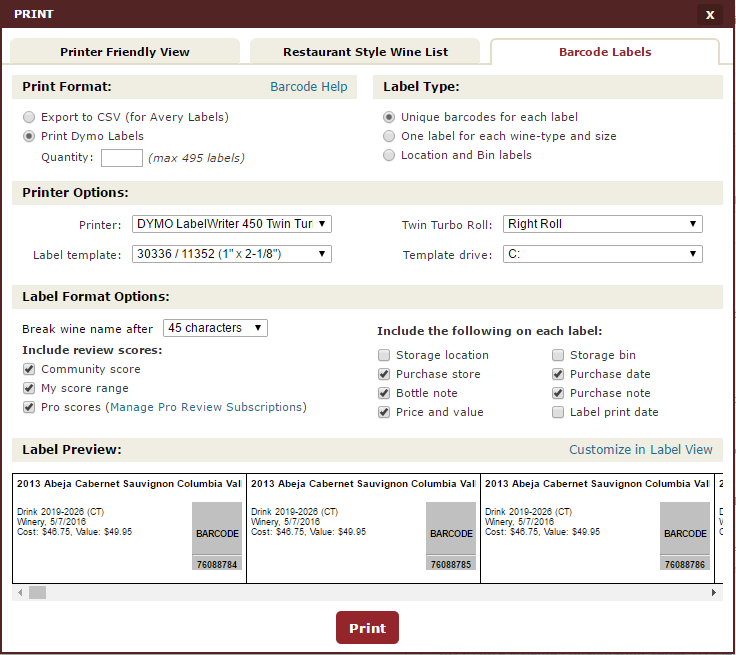 CellarTracker provides many different options to allow you to customize the information printed on your labels. This topic dives into the options available. Export to CSV: choose this option if you'd like the barcode data to be exported to a CSV file, to be used as a mail-merge dataset for creating Avery labels. Print Dymo Labels: choose this option if you'd like to print directly to a DYMO LabelWriter printer. Quantity: the maximum number of labels to print at a time. This is not the quantity per-label, but rather a way to break up large print jobs into smaller batches to make them more manageable (and to avoid having to swap label rolls in the middle of a print job). This is where you choose the type of label you'd like to print: per-bottle, per-wine, or location and bin labels. Printer: select your DYMO printer from the list. Label template: choose the correct label template based on the labels you are using. This setting is ignored for per-wine and location and bin labels. See Barcode Label Types for more details. Twin Turbo Roll: if you have a LabelWriter Twin Turbo (dual roll) printer, you can choose whether to use the left or right roll. Setting it to Auto Switch will tell the printer to automatically switch spools if/when it runs out of labels. Template drive: if you choose to customize the label templates, you have the option to change the source directory. CellarTracker will look in C:\Program Files\CellarTracker\ by default, but you can install these on any drive and configure CellarTracker to look there instead. Break wine name after: the number of characters after which the wine name will be wrapped to a second line. Include review scores: for each option (community, my scores, professional scores), a score and drinking window, if available, will be included on the label. Professional scores include both automatically integrated content channels, as well as manually entered pro reviews. Include the following on each label: for each of these options, you can choose whether to include or exclude them from the label. Bottle and purchase notes are truncated at 50 characters. Any changes you make to the label options are automatically saved once you hit the Print button.